PANAMA CITY (CNS) — Thousands of World Youth Day pilgrims stopped by the Jama Mosque Jan. 24 en route to catch a glimpse of Pope Francis. 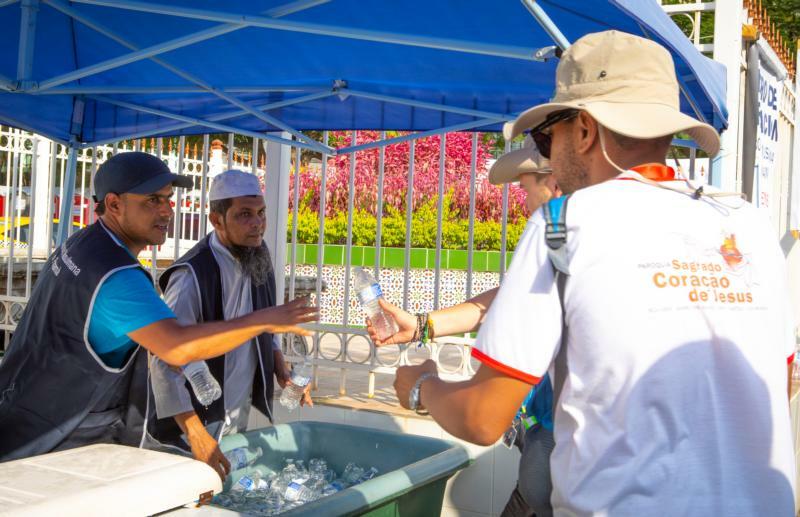 “Brothers, sisters, you need water,” Hashim Bhana yelled at them from under a tent that announced a “hydration center” outside the mosque, a place where pilgrims could pick up free water, or catch some needed shade and a smile as they struggled to stay hydrated under the blazing sun. “This is an event for the good of young people, it benefits them so how could we say no” to helping them, said Bhana. While hundreds of vendors sold water to the thirsty, the Muslim community at the oldest mosque in Panama City gave it away for free near a banner that said, “Welcome Pilgrim Friends.” By the time Pope Francis had arrived at Santa Maria la Antigua Field, they had handed out 15,000 bottles and were looking for more because of the demand, said Bhana. “What’s important to us is that we’re all brothers and sisters. We don’t ask about your religion, your skin color, age. We’re all humans and we want everyone to be well,” said Kasim Bhana, who was helping distribute water. “This was the best day,” he said.